As many of you know, my mother died last December 24th. It has been a rough year to say the least of trying to navigate life without her and deal with the myriad of repercussions of loosing someone so near and dear. I have spent the year writing down all the things that I learned from my mother in the short time I had with her, so that I can share them with my children and others. I was really impressed with how my sisters and I came together to deal with the events surrounding my mother's death. We have not typically been successful at sharing time, especially stressful time, with each other. Most usually, someone would end up with their feelings hurt and ugly things being said and someone storming out, doors slamming. It could definitely be said that we were passionate girls. Early on the journey, my mother's longtime friend Gayle, was called to help us navigate. She was a wonderful woman to have by our side as we attempted to keep our heads above water. I assure you it was no small feat for any of us. In the days and weeks directly following my mother's death, my sisters and I were met with several major decisions and gut-wrenching moments that were handled amazingly well. As we come to the end of this journey, my sisters and I have decided to get tattoos of our mother's stamp. 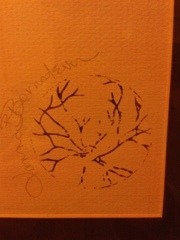 This stamp was designed by our mother and hard carved by her to be her signature on her art work. We all really love the way it looks and feel like it is exactly the way we want to commemorate her love and life. So, on December 22nd, my sisters and I will be getting this tattoo. From the moment the decision was made, none of us had discussed where on our bodies we intended to have the tattoo. Then about a month ago, we were all talking about where we would be getting the tattoos. It turns out that my youngest sister and I will be getting them on the same spot, under our left arm on our ribs. Our middle sister, Claire, will be getting hers on her wrist. At the same time, I'll be finishing up my letters on my wrist.